Making important decisions with ConceptDraw Remote Presentation for Skype solution becomes a clear process. Before taking any crucial decision use ConceptDraw MINDMAP as progressive decision making tool. The next six tips for making decisions show how a decision can be made in a systematic way. Define a Problem. Type the problem as Main Idea at mind map. Develop Alternatives. Also type them as subtopics of the main idea. Evaluate Alternatives. For each topic of alternatives you can write all supporting information in the notes. Make Decision. Create the presentation and sort the slides for more understandable way for solving the problem. Implement Decision. Use ConceptDraw Remote Presentation for Skype solution for presenting decision to you team . Monitor the implementation of your decision. Making a decision mind map sample is created using ConceptDraw MINDMAP mind mapping software. 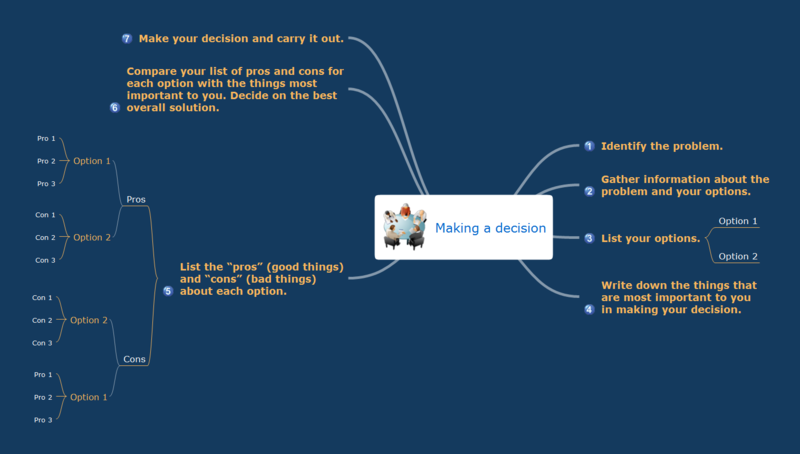 This mind map example helps to learn how to use mindmap presentation via Skype for team training on decision making.